Rainbow 3D Moving Averages were developed by Ivan Ballin (Ingot54) as a variation of the Multiple Moving Averages of Daryl Guppy. Exponential moving averages ranging from 2 weeks to 200 weeks are plotted on the price chart using the full color spectrum. The indicator is very useful in highlighting trend changes -- when your eyes have adjusted to the array of colors. The most important signals are taken from the spacing between the MAs in each group; not from crossovers. When moving averages converge, this is a sign that the group view is changing. Short-term MAs tend to bounce off the long-term MA group. Both groups of MAs converge and fluctuate more than usual. A change in price direction accompanied by expanding MAs in both groups. The short-term group cross over, diverge and then again converge; while the long-term group remain parallel. 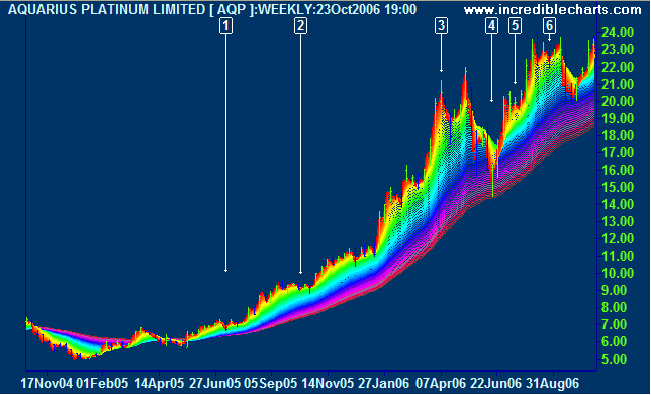 Aquarius Platinum Limited (AQP) is shown with Rainbow 3D Moving Averages. Select Rainbow 3D Moving Averages in the left column of the Indicator Panel. Adjust the settings as required and save using the [>>] button. The default is Weekly moving averages.